Well would you look at that: an indie film about the creative mind that doesn’t come from such a dark place. Frank opens as Jon Burroughs (Domhnall Gleeson) walks down the beach of his quaint British hometown and constructs lyrics in his head based on everything he sees. Most of the stuff he comes up with is terrible. Then again, when you try and create stuff, a majority of the stuff that you come up with is going to be crap. There is a difference between aspiring to do something and being a wannabe. “Aspiring” means that you have what it takes and just need time to get there. Wannabe means you want it, but maybe you don’t deserve it. Jon strikes me as more of a wannabe. He gets lucky one day when a band shows up looking for a keyboardist. And guess what? Jon just so happens to be a keyboardist. What Jon stumbles upon is a band of misfits who can’t even get along. And as Ben Franklin once said, “a band divided can never truly rock ‘n roll.” Anyway, the band is led by Frank (Michael Fassbender), an incredibly talented musician who hides behind a giant mask during all hours of the day. Director Lenny Abrahamson somehow finds a way to use this joke to its full potential without ever destroying it. Now, Frank’s mask seems like it could be some kind of gimmick. However, it doesn’t represent quirkiness, but rather hidden insecurity. Frank manages to shoot down some of the less-than-desirable indie tropes by showing what these characters are trying to hide. Sometimes, they are hiding much less than it seems. 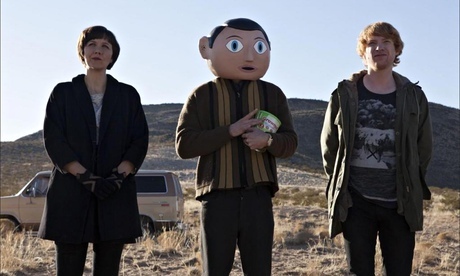 Frank is an odd little film that never tries to justify all of the strange things about it, and that is exactly what I liked about it so much. Either you’ll embrace the band members, or they will get on your nerves. If they do get on your nerves, then it is only your fault. It is hard to ever really get a sense of the potential that Jon sees in the band, but that is because we are trusting an unreliable narrator. Jon doesn’t care about music, he just cares about unmasking Frank. It is the rare MacGuffin that only one person actually cares about. Maybe I should mention that while Frank is about broken people, it is light on its feet and ever so funny. It is unpredictable at every turn, and surprisingly poetic. It doesn’t act like it wants to be though. Frank feels like one great, big happy accident. Frank is based on a real guy. Look it up. I love the original song that Jon tries to write about suburbia. It is basically a confused Springsteen song meets the Weeds theme song. His misguided confidence really sells it. It still bothers me when films try and incorporate social media. However, Frank did it well by not calling too much attention to it. They weren’t saying “look mom! look at me tweet!” Instead, tweets and Tumblr posts served as diary entries. Maybe I am alone in this, but I saw little shades of A Clockwork Orange in this. Not to mention, they do sing one of the songs from its soundtrack. Somebody back me up here. If you watch this along with Not Fade Away, it would make a great double feature of films about failing at artistic pursuits. Fun! Even though Frank’s mask hid Frank’s emotions, it sometimes seemed like that mask took on a life of its own. Sometimes, I felt like it looked happy when Frank said he was happy, and sad when he said he was sad. I watched Frank on iTunes just a few weeks after it was first released in theaters. “Direct-to-video” used to be a bad thing. Now, it’s the only way indie films can make money. This entry was posted in Uncategorized on September 6, 2014 by ian0592.